As always, Saturday brought us a full slate of MLB action. There were 15 games in the schedule, including some increasingly uncommon Saturday afternoon contests. The Athletics and Rangers were rained out in Arlington, and they'll make up that game as part of a spilt doubleheader on June 8. The Cardinals and Reds began their two-game series in Monterrey, Mexico on Saturday. It is the first of two series in Monterrey this year (Angels will face Astros in May) and second of four series at alternate sites this season (Athletics vs. Mariners in Japan, Yankees vs. Red Sox in London). MLB games will be played in three different countries this weekend. Jose Altuve homered for the fifth straight game in the Astros' 3-1 win over the Seattle Mariners. Houston has won its past eight games, the longest winning streak in baseball so far this season. On the flip side, the struggling Rockies dropped another game and have now lost seven straight. That and everything else you need to know about Saturday's MLB action coming up in our daily roundup. Now let's jump in. Tampa Bay Rays ace Blake Snell struck out nine over six scoreless innings against the Toronto Blue Jays. The reigning American League Cy Young winner lost a no-hit bid in the sixth inning when his former teammate, Toronto catcher Luke Maile, knocked a single into left field. We have a breakdown of Snell's fourth start of the season as he tries to do something no one since Pedro Martinez has done. The Blue Jays went on to beat the Rays 3-1, snapping Tampa Bay's five-game winning streak. A side note: this was the fifth time this season that Toronto has been no-hit though at least five innings. Snell's next start is scheduled against the Boston Red Sox on Friday (GameTracker) and the game can be streamed regionally via fuboTV (Try for free). The young San Diego Padres won their fourth straight game of the season, 5-4 over the Arizona Diamondbacks. 20-year-old Fernando Tatis Jr. hit a two-run homer and 23-year-old Franmil Reyes had a tie-breaking solo shot in the seventh inning. San Diego's 11-5 record can also be credited to the club's talented young pitching staff. Read up on the young rotation's impressive start to the season here. With Saturday's win, the Padres extended their hold on first place in the National League West to a three-game lead over the Los Angeles Dodgers. At long last, Chris Davis is back in the hit column. The struggling Orioles first baseman ended his MLB record 54 at-bat hitless streak with a two-out, two-run first inning single against Rick Porcello on Saturday. Here is the slump-busting hit. Davis did ask for the ball and receive a nice hand from the fans at Fenway Park. He added not one, but two doubles later in the game. Prior to that single, Davis had been hitless in 62 consecutive plate appearances (also an MLB record) and 33 at-bats this season. His last hit prior to Saturday was a double against then-White Sox righty James Shields last September 14. You can read more about Davis and his brethren in futility right here. Following offseason knee and heart surgery, CC Sabathia returned to the Yankees on Saturday afternoon, and he gave his team exactly what it needed. Sabathia threw five shutout innings and allowed just one baserunner (a soft single) while being held to a strict pitch count (he threw 62). Sabathia's average exit velocity allowed Saturday was 88.7 mph. Up a tad from last year but still very good overall. The White Sox stacked their lineup with righties and Sabathia had no trouble busting them in on the hands with cutters and getting them to reach for changeups down and away. Prior to Saturday's game, Yankees starters other than Masahiro Tanaka were averaging under 4 2/3 innings per start so far this year. Sabathia doesn't pitch deep into games anymore, but he is still rather effective on a rate basis, and he was able to give the Yankees a much needed quality outing while on a pitch limit Saturday. Alas, Sabathia's offense gave him zero support. CC Sabathia: 1st Starter in Yankees history to pitch at least 5 innings, allow 0 ER and no more than 1 baserunner … and not get the Win. You can read more about the depleted Yankees and their problems right here. Astros second baseman Jose Altuve homered in a career-high fifth consecutive game on Saturday against the Mariners. Altuve crushed a solo shot off Felix Hernandez, and he's now 16 for 32 with two home runs against the Cy Young winner in his career. As MLB Stats notes, Altuve is the fourth player in Astros history to homer in five straight games, and the first Astros player to accomplish the feat since Morgan Ensberg homered in six straight games back in 2006. Free agent closer Craig Kimbrel reportedly wants about $15 million per year, instead of hunting down a record-breaking deal as he previously aimed to do. We have more on the MLB teams that have no excuse for the lack of interest. 3B Vladimir Guerrero said he has not yet had long-term extension talks with the Blue Jays. If the two sides talk soon, Vlad Jr. could try to beat Eloy Jimenez's six-year, $43 million contract with the White Sox. The Rangers have placed 2B Rougned Odor on the 10-day injured list with right knee sprain, the team announced. He suffered the injury during batting practice Friday. UTIL Danny Santana was called up in a corresponding move. 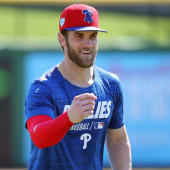 The Phillies have not yet had contract extension discussions with C J.T. Realmuto and 1B Rhys Hoskins, reports Philly.com. Realmuto can become a free agent following the 2020 season, Hoskins not until after 2023. The Indians are expected to add OF Carlos Gonzalez to their roster Sunday, reports Cleveland.com. CarGo signed with the Indians late in spring training and has been getting ready in minor league games. Twins 3B Miguel Sano will take on-field batting practice Saturday, reports MLB.com. If all goes well, he could begin a minor league rehab assignment next week. Sano has been out with a heel injury. Pirates RHP Jameson Taillon has been cleared to make his next start, reports MLB.com. Taillon was hit in the head by a line drive in his last start, though all tests came back OK.